Public education advocates have hailed Mayor Kenney's commitment to dramatically bolster funding for the city's public schools, promising in his annual budget address to provide $980 million in additional money over the next five years. "I've come to the conclusion that no savior in Washington or Harrisburg is sailing in anytime soon to save our school system," Kenney told the Inquirer and Daily News editorial board Thursday. "There's no sense in presiding over a poor city and never doing anything to change it." To do that, the mayor is turning to familiar sources: The taxpayers. So just how much more are they going to be paying? That would vary with earnings, property valuations, and whether people plan to buy or sell real estate in Philadelphia. Kenney proposes raising the property-tax rate by 6 percent — from 1.3998 percent to 1.4838 percent. "The real estate taxes in the suburbs are substantially higher, and their schools are substantially better," Kenney said when asked if residents could handle another increase in property taxes, which City Council voted to raise four times under former Mayor Nutter. "Property taxes go up in the suburbs consistently, too." Although that's true, the city is far more reliant than surrounding communities on income taxes. $42 in additional property-tax bills in 2019 for the owner of a home assessed at $50,000. $84 in additional property-tax bills in 2019 for the owner of a home assessed at $100,000. $126 in additional property-tax bills in 2019 for the owner of a home assessed at $150,000. $210 in additional property-tax bills in 2019 for the owner of a home assessed at $250,000. The proposed budget also includes a provision to increase the property-tax homestead exemption, which currently allows a homeowner to lower the assessment of a primary residence by $30,000 for purposes of calculating property-tax bills. Kenney proposes increasing that exemption to $40,000. The estimates above do not account for the homestead exemption. For a home assessed at $100,000, a $40,000 homestead exemption would reduce the proposed 2019 total tax bill from $1,483 to $1,038. 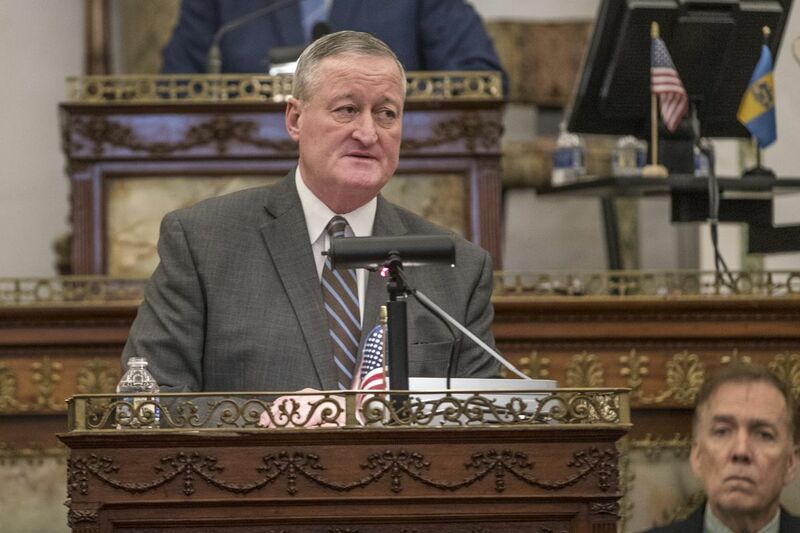 The change in the homestead exemption would allow homeowners with properties worth less than $200,000 to receive a tax reduction rather than an increase, Kenney said. The wage tax, currently 3.8907 percent for residents and 3.4654 for people who work in the city but live elsewhere, has long been on track to decrease annually. Kenney's budget would slow the rate of annual reductions. Under the current budget and five-year plan, the wage tax would still decrease in fiscal year 2019, to 3.8430 percent for residents and 3.4221 percent for nonresidents. Kenney proposes a smaller decrease, to 3.8809 percent for residents and 3.4567 for nonresidents. Over five years, the city estimates that a slower rate of wage tax reductions would give the School District nearly $340 million. Someone who earns $25,000 a year would pay $9.73 more in wage taxes next fiscal year than if the city stayed on the wage tax reduction plan set in the current budget. Someone earning $50,000 per year would pay $19.45 more in wage taxes than under the current plan. Someone with a $100,000 annual salary would pay $38.90 more in wage taxes than under the current plan. Someone who earns $150,000 per year would pay $58.35 more in wage taxes than under the current plan. Someone earning $25,000 per year would pay $8.65 more in wage taxes than under the current reduction plan. Someone who earns $50,000 annually would pay $17.30 more in wage taxes than under the current reduction plan. Someone with a $100,000 annual salary would pay $34.60 more in wage taxes than under the current reduction plan. Someone earning $150,000 per year would pay $51.90 more in wage taxes than under the current reduction plan. Real estate transfers currently have a 4.1 percent tax — 3.1 percent of which is levied by the city, with the remaining 1 percent going to the state. Kenney proposes raising the tax to 4.45 percent, which he says would raise an additional $66 million for the School District over five years. For a home that sells for $150,000, the real estate transfer tax would increase by $600, to a payment of $3,375 each by the buyer and the seller. A home that sells for $300,000 would have a transfer tax increase of $1,200 and a new total payment of $6,750 each by the buyer and the seller. A home that sells for $600,000 would have a transfer tax increase of $2,400, or a new total tax of $13,500 each by the buyer and the seller. City Council will hold hearings and will make changes and suggestions before passing a budget, which would take effect in July. Kenney said he understood that City Council members would have their own ideas — in the past the Council has voted for lower tax increases than those proposed by mayors — but he stuck to his talking points on education. "People who proclaim they're for education," he said, "need now to show they're for education."